The majority of gas lift bar stools come as four major parts, which slot together easily within minutes for an effortless assembly. In this article we will take you through each individual part. The first part is the base, which is designed to keep the whole stool stable and varies in size with design. This can come as either a round conical base or a flat base; which are usually square but can be circular depending on the style of the stool. Whilst the coned shape helps round bases with stability, flat bases are a lot heavier and lower the centre of gravity to counteract the seat above. The conical base has a rubber ring beneath that protects floor surfaces from scratches, and has a hole in the middle to accommodate the gas lift mechanism, whilst flat bases have felt pads below which offer excellent protection of more delicate flooring. Pictured below is a hydraulic gas lift mechanism that slots into the hole on the round base, where it locks into place with a compression joint for a solid construction. A decorative chromed collar is available on a number of styles, fitting between the base and gas cylinder to decorate the joint where the two parts meet for a trendier look. On flat bases, the hydraulic is held in place by a number or bolts, making a rigid connection that can be tightened with an Allen key. The hydraulic, which provides the stool with variable height and 360 degree swivel, is made up of two cylinders with a valve between that controls air flow, activated by a button on the narrower end. When this button is pressed, an unloaded hydraulic will expand to raise the stool, and when loaded will compress to lower it. These last 2 parts are probably the most interesting as they influence the overall styling, shape and comfort the most. Slotting over the top of the gas lift mechanism is the footrest, which is usually welded to a slender stem that protects the joint between the two parts of the gas lift. The footrest comes in a variety of designs, from half moon shaped (pictured below), circular designs held by spokes to more designer squared and even triangular, that add visual impact. A number screw directly to the seat, such as the neck of the Coco bar stool, or the cascade footrest of the Niagara. The top section also houses the lever that activates the hydraulic, depressing the button when pulled upwards. You will note that on the lower section, there is a nylon sleeve, in this case black. The function of this is to reduce friction between the footrest and column. Finally, the bar stools are topped out by the seat, which is affixed to the footrest by four bolts and usually washers, making a secure and steady connection. Some seats have a pair of spacers that are placed between the front screw holes and the metal plate at the top of the footrest, increasing the gap between and giving the seat a slight incline. This is only showcased on some models however, enhancing the design and giving a more relaxing seating position. 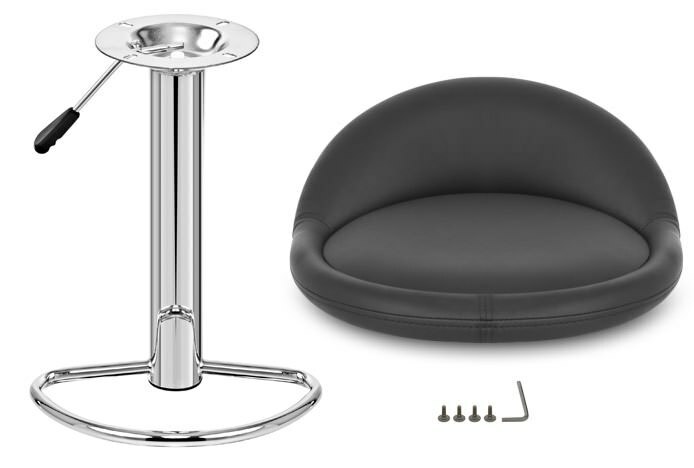 Whether flat based or round based, gas lift or fixed height, you can rest assured that all of our bar stool components are carefully crafted to the highest standard. 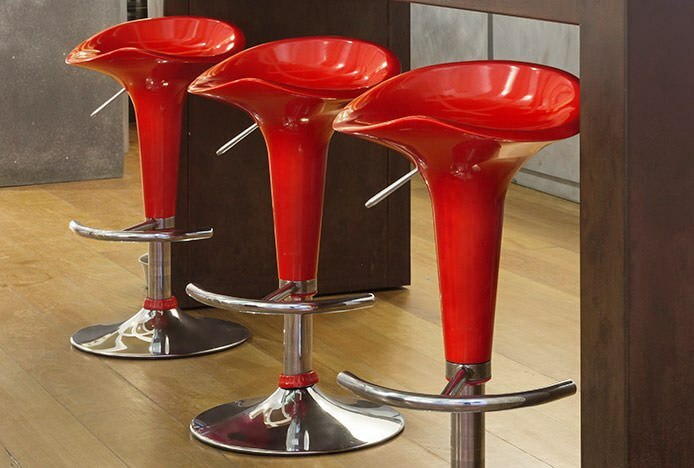 For more information about assembling your bar stools, take a look at our Bar Stool Assembly Guide. Or, to find your perfect match, use the button below to view the entire collection now.